Leftovers, what do you do with your leftovers? We took some leftover Michigan Sauce and some leftover Fra Diavolo and we made Dirty Rice and then stuffed some green peppers with it, it was easy, it was DELICIOUS. Here's how we did it! If you don't have peppers, just make Dirty Rice. We had about 3/4 lb leftover Michigan Sauce (that's with the hamburger cooked in) and about 1/2 jar (12 oz) or small jar of Fra Diavolo. Cut your peppers in half, remove seeds and stem. 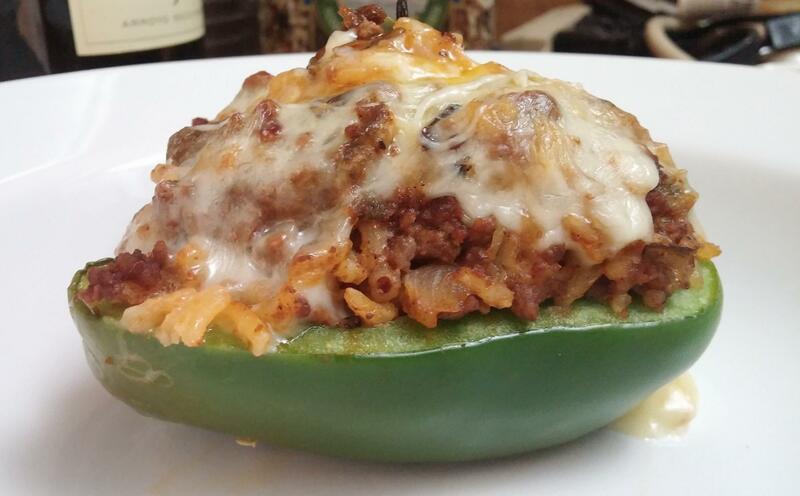 stuff the peppers, top them with some grated cheddar & mozzarella cheeses and bake for 350 degrees for 20 minutes. Freeze extra's and then reheat for lunch or dinner another day.